It comes as quite a surprise that once launched as a hip-hop project, The Black Eyed Peas today are mostly hated by hip-hop fans. Well, they can not stand watching this band doing all kinds of things to their favorite genre. In fact, while hip-hop became less tangible on the popular American outfit’s albums, their music became more and more popular. Last year’s attempt, The E.N.D. (2009) is practically completely stripped off the influence of the school The Black Eyed Peas came out of when they started. Later, they went deep into electronica, funk and other kinds of dance sounds, which turned into a true passion never seeming to fade away. One year later, applying the old trick of contrast, the musicians released an album with antonymic title - The Beginning. Confidence of their own powers and ever-growing popularity let the band feel fully free. Otherwise, you can not explain why they decided to make the single The Time (Dirty Bit) based on the theme taken from Dirty Dancing released almost quarter century ago. The idea of exploiting pleasant recollections shared by the audience who also watches movies is not so innovative, but how many performers execute such initiations on the same level as TBEP? 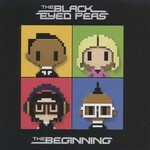 Whether it is good or not so good, The Beginning once again shows the true nature of The Black Eyed Peas more likely looking like a duet rather than a quartet. This is far from the first time when the entire process is controlled and driven by the tandem of the music maniac will.i.am and the eye-catching singer Fergie. The former has delivered in the last decade a whole package of dance hits with amazing beats and perfect arrangements. And his female partner turned simply good dance numbers into genuine anthems making everyone hearing them singing along. The drive breeding music and fascinating melodious vocal parts are the fundamental aspects of all The Black Eyed Peas best hits. The rest are details that they can replace or alter. This time, the band walked around the dance stage traveling twenty years back. They collected harvest of plain rhythmic patterns and primitive melodies, all turning into nice, modern-sounding numbers thank to the talent of the wonderful arrangers. Yet there was something that went wrong. Piece like the aforementioned The Time (Dirty Bit) as well as Light Up The Night, and Love You Long Time are good in their retro-stylishness and danceability, but you are lucky if you do not get the words, some just too silly, other even close to indecency. It does not look like those good and old The Black Eyed Peas well known for their sarcasm, ability to put in a spicy line or witty phrase here and there. Dedication may turn really dangerous because it makes people lose the sense of proportion. After quite a vibrating and exhilarating start of The Beginning, that would seem rational to add in some different types of songs with better lyrics and slowed down tempo. Alas, the whole set is desperately poor in them. Of all the songs, most of which falling into a great mass after the first listen, you are likely to be hooked by, probably, Someday with guitar insertions and ethnic motives, and Fashion Beats with a fancy singing line. Actually, when The Black Eyed Peas music fails to reach the level the band once established, the hope rests on Fergie, whose vocals saved a couple of songs. If it was not for her outstanding efforts, The Best One Yet (The Boy), and The Situation would be just another two mediocre songs with predictable instrumental parts. After The Beginning, the members The Black Eyed Peas should once again take a look at themselves as a quartet, not a duet, because the labor of these two is not enough, especially if they want to release a new record each year or two. Had they released this album in the beginning, according to its title, the audience would have found no flaws, no errors. But The Black Eyed Peas are a band that made a hard-to-get standard for themselves and their competitors; and now it would take them something more to follow it on.